﻿ VIDEOS: Decktop Pond Season Is Here! Screen image of the Aquascape Patio Pond, a prefabricated and purpose-designed option for container pond keeping. Watch the video below! With spring now undeniably here, even on the frozen hills of Duluth, MN, my attention once again has turned to the outdoors and our gardens. Hostas are sending up pips, and the seeds we started indoors have moved outside to get acclimated. I’m digging up and dividing perennials in advance of garden swap and garage sale season! Making my first visits to the garden departments of area stores to purchase things like mulch and compost, I can’t help but walk by the big stack of half whiskey barrels, and wonder if this is the year I finally take my aquarium hobby outdoors. My friend, fellow marine fish breeder and fishroom sitter Mike Doty has a particularly interesting outdoor “aquarium,” and ever since seeing it, a small, potentially temporary setup like this has always caught my attention. My neighbor even has an empty pond situated directly between our two homes, and there’s a standing invitation to get it back in operation should I want to. The Outdoor Aquarist, by Rachel O’Leary, presents ideas for bringing tropical fishes outside in the summer for breeding and growout. 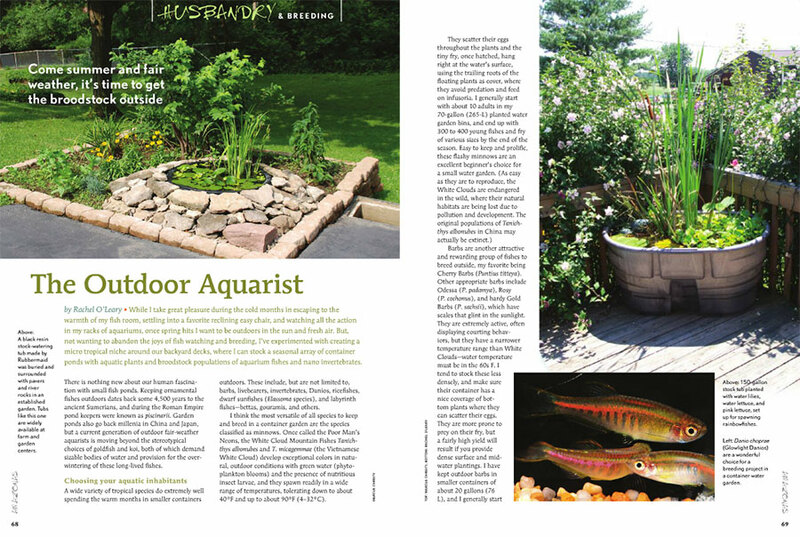 Published in the July/August 2014 issue of AMAZONAS Magazine, The Outdoor Aquarist, by Rachel O’Leary, took the outdoor container pond a step further, showing how we’re truly not limited to goldfish and temperate species outdoors during the warm summer months. Expanding your fishroom outdoors for summertime propagation and growing offers yet another way to increase the bounty. Plus, many familiar “tropical” species are actually cool-water tolerant. For a very northern aquarist like myself, it simply has me thinking about oversized heaters to take the edge off some cold nights. For me, air-driven filtration is also an option; plenty of spare air is available from my fishroom’s setup! Just have to fish a line out a window or follow the power line that goes out to the garage! I’d love to see our readers’ patio ponds this summer, so for now, I’ll start by offering a series of container pond videos that got me thinking and dreaming. Perhaps they’ll inspire you as well. 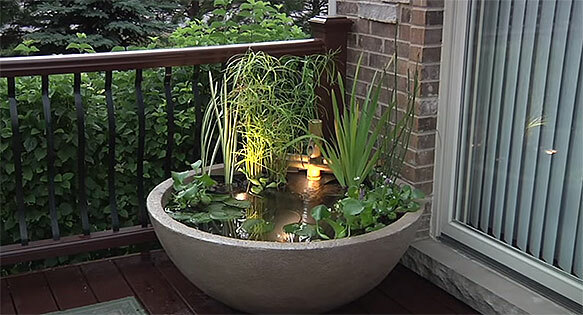 If that’s not enough inspiration, check out some of the amazing deck-top ponds featured on the “Container Ponds & Ponds in a Pot” Pinterest page! Short on space? Container ponds and “ponds in a pot” fit anywhere. See more on Pinterest! I hope to see some great container ponds this summer, and maybe we’ll even feature a couple of the best if you really knock our socks off! In the meantime, I’m off to figure out how I explain this new project to my wife…wish me luck! If you’d like to read Rachel O’Leary’s article, The Outdoor Aquarist, you can order the back issue of the July/August 2014 issue of AMAZONAS Magazine.